I'm taking a break from the top 50 list from Open Doors USA this week to talk about a location a little closer to home. The state of Chiapas, in southern Mexico, is not listed by Open Doors USA, but is listed by Persecution.com, which is the website for The Voice of the Martyr. Unlike the rest of the top persecuting states, this one is not a country proper, but is actually just a state. 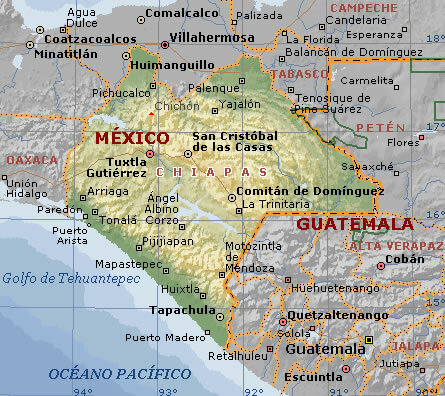 Even though most areas of Mexico, despite the violence and drug issues, is fairly open to Christianity (I've been to Tijuana and Mazatlan), the state of Chiapas is not. The religion of the state is primarily Catholic mixed with some pagan ideology. The state leaders apparently think of evangelical Christianity as a threat to power, which it usually isn't overseas, and therefor has sought to dismantle it, starting with hurting the believers in the area. Read the Persecution.com report linked to above for details. More information can be found at a blog called Persecution in Latin America. There is also information from VOM/MEX.